This dramatic photograph shows a black rat eating a thrush egg. This common rat species (Rattus rattus, otherwise known as a bush, roof or ship rat) is one of three that has long made its home in New Zealand. The first to arrive on these shores was the kiore or Pacific rat (Rattus exulans) which was brought to New Zealand by Maori. 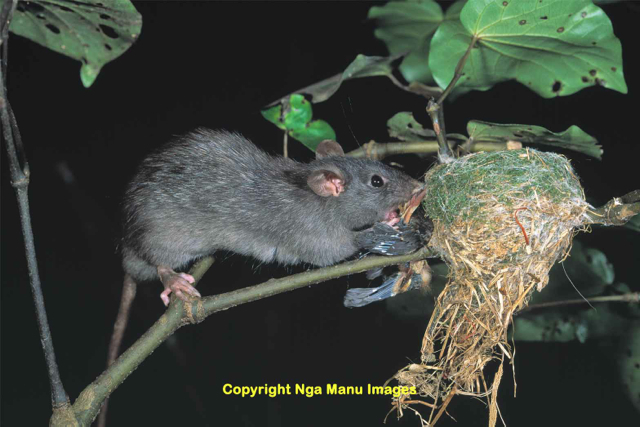 This rat, regarded as a taonga (cultural treasure) is now very limited in its distribution. The same cannot be said however for the two species introduced by Europeans (most likely as stowaways on ships). Norway rats (Rattus norvegicus), also known as brown or water rats, were on the ships of the first explorers in the late 1700s. These rats quickly spread. Black rats were also on European ships, but these did not become established until after the 1860s. 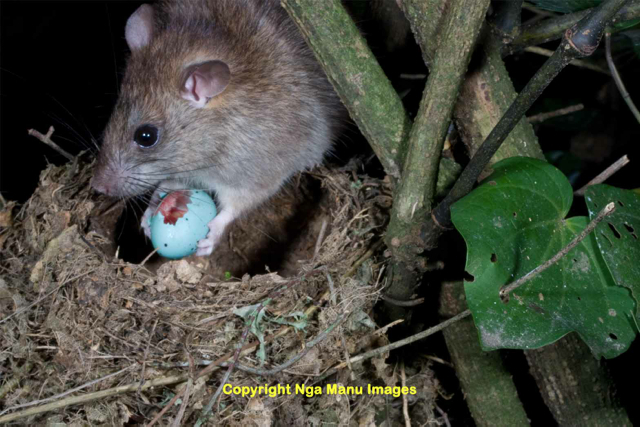 They are now pervasive throughout native forests, scrublands, and urban parklands (their almost universal distribution in New Zealand is unusual – elsewhere in the world, black rats are found only in disturbed habitats near people, mainly near the coast. This is typical only of oceanic islands that lack native mammals, especially other rodents). The spread of black rats caused the sudden decline of many native bird and bat species. For example, when they were accidentally introduced to Big South Cape Island (off Stewart Island) in 1964, they quickly eliminated five types of native bird, one bat species, and a large flightless weevil. A black rat eating a fantail chick, Horowhenua. This image comes from Nga Manu Images, a photographic treasure trove of New Zealand’s natural heritage. These images are free for use for educational, conservation or research purposes. A donation is requested for use for commercial purposes. Nga Manu Images is maintained by Nga Manu Trust, a non-profit organisation that also runs the Nga Manu Nature Reserve in Waikanae. The need to use 1080 is not ideal but if we don’t …….? Those who oppose it don’t have an alternative. Lots of rat traps?